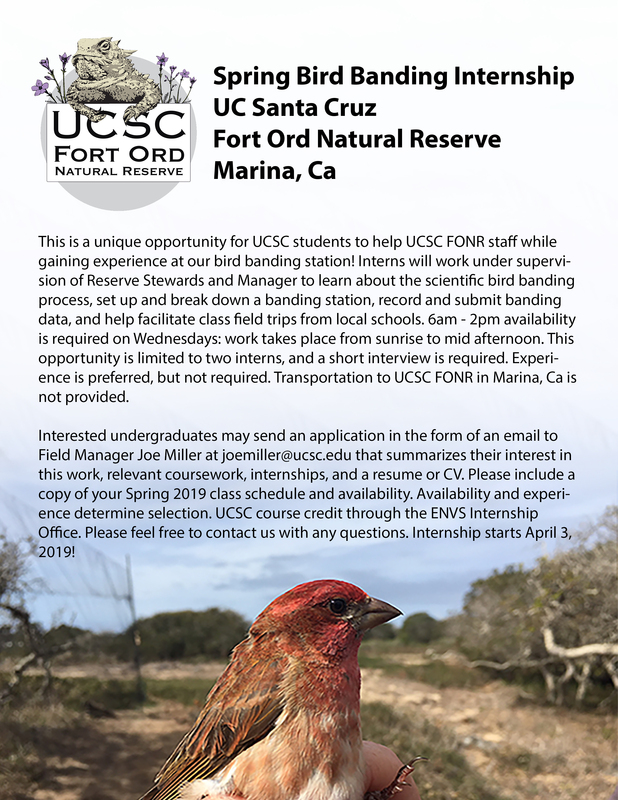 This is a unique opportunity for UCSC students to help UCSC FONR staff while gaining experience at our bird banding station! Interns will work under supervision of Reserve Stewards and Manager to learn about the scientific bird banding process, set up and break down a banding station, record and submit banding data, and help facilitate class field trips from local schools. 6am - 2pm availability is required on Wednesdays: work takes place from sunrise to mid afternoon. This opportunity is limited to two interns, and a short interview is required. Experience is preferred, but not required. Transportation to UCSC FONR in Marina, Ca is not provided. Interested undergraduates may send an application in the form of an email to Field Manager Joe Miller at joemiller@ucsc.edu that summarizes their interest in this work, relevant coursework, internships, and a resume or CV. Please include a copy of your Spring 2019 class schedule and availability. Availability and experience determine selection. UCSC course credit through the ENVS Internship Office. Please feel free to contact us with any questions. Internship starts April 3, 2019!